Orb Composer doesn’t replace the composer and doesn’t write music automatically. You have to feed Orb with your own choices. Orb creates music mock-ups based on your creativity and only with your musical ideas. You can create a complete musical environment according to the ideas you want to experiment. Orb updates in real time according to your new inputs. Orb Composer embeds a library of chords progression which you can enrich. It Includes many of the chords used in the music industry. Orb Composer provides a complete range of possible harmonic colors. Create your own music styles and experiment with exotic instruments mixes, chord progressions, time signatures and accurate instruments clip settings. Thanks to Orb Composer, you can reach the level of high quality required by the TV programs of broadcasting. Focus on the creative part of music before diving into the notes. Orb Composer perfectly integrated in any of your work environments. Whether it’s a home studio or a professional one. Orb Composer synchronizes with any popular software: Logic, Cubase, Pro Tools, Reaper, Sonar, Live, Studio One). Orb Composer works with all of them! It synchronizes itself with your DAW and allows you to listen your composition live, through virtual instruments joined into your DAW. Listen to the tracks in real time through your favorite DAW and adjust all the music parameters live. A complete mapping tool is provided to sync all instruments and articulations with your DAW. 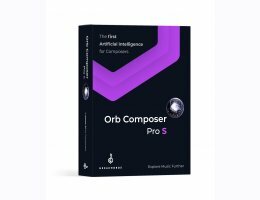 Orb Composer embeds the most powerful AI ever designed for orchestration. All the different instruments of the orchestra, with all their different articulations have been modelled individually, to reach a high level of orchestration knowledge. Any crazy idea is welcome in Orb Composer. Want to write a symphonic score with an electric guitar playing the music theme? That’s possible! Quickly experiment exotic instruments combinations and see which one you want to stick to, and develop your ideas inside the final score. Turning an idea into a composition will not take weeks of work anymore, only the most pleasant part of composition will remain. Orb Composer features have a significant benefit in terms of time and energy as it reduces time to experiment with new ideas and speed up the composition process. Create your own music mock-ups in Orb Composer and use them as a very good starting point for your composition. For full spec details and supported DAWs, please Read the FAQ at the manufacturer page.